At Leonard's, we understand that you're planning one of life's greatest events. Our staff and the warm and friendly atmosphere we have created will accomodate all of your planning needs, whether your wedding is for 75 guests or 750 guests. Get more for your wedding! 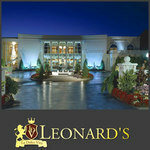 Don't forget to mention ChossonKallah.com when visiting Leonard's of Great Neck.